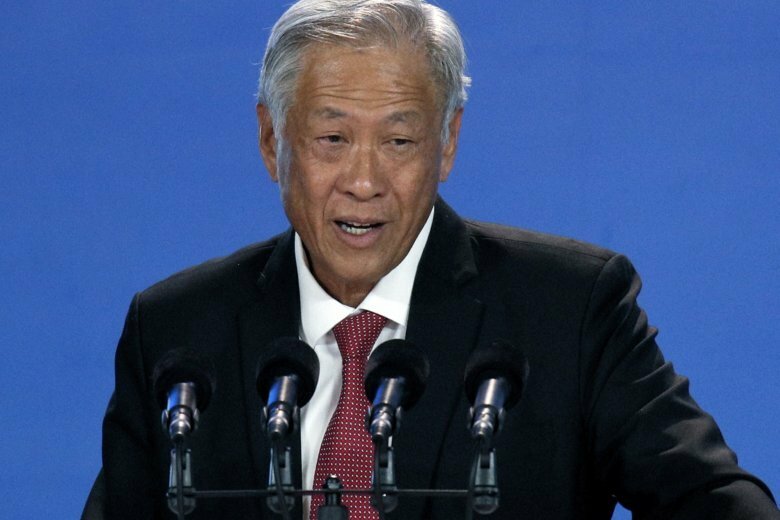 Singapore’s defense minister says the latest round of South China Sea conduct talks between China and the Association of Southeast Asian Nations will be held later this month. While in Germany, Ng also attended the launch of the first of four new submarines for Singapore’s navy. The sides have claimed progress on concluding a code of conduct in the South China Sea, long touted as a way of avoiding volatile confrontations in the disputed waters. Chinese President Xi Jinping in November said negotiations on the code could be concluded in three years and promised that any differences would be dealt with peacefully. Negotiations on the code formally began in March, after the adoption in 2017 of a framework agreement. In 2002, the sides signed a non-binding Declaration on the Conduct of the Parties in the South China Sea as a precursor. Observers are watching closely whether China will agree to binding conditions in a future COC, given its past refusal to be held to international rulings over a region in which it asserts full freedom of action due to its territorial claims. China rejected a 2016 ruling by an arbitration tribunal in The Hague that invalidated its sweeping territorial claims in the South China Sea based on historical grounds. CHINA JOINS IN ANNUAL DRILLS HOSTED BY THAILAND, U.S.
Thailand and the United States kicked off the annual Cobra Gold military exercise, the biggest activity of its type in the Asia-Pacific region with 29 nations taking part as participants or observers — including China. The exercise, first held in 1982 and running through Friday, aims to strengthen cooperation and inter-operability through military field training, humanitarian assistance and disaster relief training. Its goals include “enhancing maritime security, preventing and mitigating emerging disease threats, and responding to large-scale natural disasters,” a U.S. statement said. The naval commander in the Indo-Pacific region says the U.S. will maintain the recent pace of freedom of navigation operations in the South China Sea aimed at challenging China’s territorial claims. Adm. Phil Davidson told the Senate Armed Services Committee last Tuesday that China’s effort to extend its territorial and economic influence was a bigger long-term threat to the free movement of trade and people in the region than North Korea. “Through fear and coercion, Beijing is working to expand its form of ideology in order to bend, break and replace the existing rules-based international order,” Davidson was quoted as saying by the U.S. Naval Institute News. “In its place, Beijing seeks to create a new order, one with Chinese characteristics, led by China, an outcome that displaces the stability and peace in the Indo-Pacific that has endured for over 70 years,” Davidson said. Britain has said it plans to deploy its new aircraft carrier, the HMS Queen Elizabeth with its two squadrons of F-35 Lightning fighters, to the South China Sea. China is belied to have canceled a meeting with Britain’s Chancellor of the Exchequer Philip Hammond in response to the announcement earlier this month. Two U.S. warships sailed nearby to Chinese-controlled islands in the Spratly group in the second freedom of navigation operation staged by the Navy this year. The guided missile destroyers USS Preble and USS Spruance sailed inside the 12 nautical mile (22 kilometer) territorial waters limit surrounding the islands as they passed through the area. The operation aimed “to challenge excessive maritime claims and preserve access to the waterways as governed by international law,” Cmdr. Clay Doss, a spokesman for the US Navy’s 7th Fleet, said in a statement. China routinely objects to such missions and dispatches vessels and aircraft to warn off the American warships. Beijing says such missions fuel tensions and does not recognize their validity under the United Nations Convention on the Law of the Sea — or UNCLOS— which defines the rights and responsibilities of nations sailing the world’s oceans. “We firmly oppose any activity that undermines China’s sovereignty and security interests under the pretext of freedom of navigation,” Yang told participants.